The aortic valve is a remarkable piece of biomechanical engineering. On any given day, the leaflets (or cusps) of a healthy aortic valve will open and close 100,000+ times, allowing the proper amount of blood to flow from the heart to the rest of the body. Over a lifetime, a healthy valve endures more than 3.4 billion heartbeats. Unfortunately, the aortic valve doesn’t always remain healthy. (What organ does?) According to the American Heart Association, up to 1.5 million people in the United States suffer from aortic stenosis (AS), a calcification of the aortic valve that narrows its opening and restricts blood flow. In the early stages, the disease is often asymptomatic, but as it progresses, it can cause chest pain, weakness, and difficulty breathing. And in approximately 300,000 people worldwide, the condition develops into severe AS, which has a one-year survival rate of approximately 50 percent, if left untreated. Fortunately, there are treatment options. The most common and successful is aortic valve replacement (AVR), wherein a mechanical or tissue-based valve is substituted for the diseased valve. For decades, replacement valves were implanted via open heart surgery, which involves an extended hospital stay and months of recovery. But in recent years, a promising new approach has emerged: transcatheter aortic valve implementation (TAVI), also known as transcatheter aortic valve replacement (TAVR). 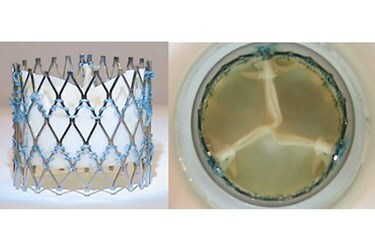 In TAVI, a tissue-based artificial valve is delivered into the diseased heart valve via a blood vessel, rather than through a large incision in the chest. TAVI has many benefits, the most obvious (and compelling) of which is its noninvasiveness, which means shorter recovery times and faster attainment of quality-of-life outcomes for the patient. Replacement of a transcatheter aortic valve (TAV) can also be a minimally invasive exercise — a second TAV can simply be implanted within the first. What’s really needed is an improved TAV — one that outperforms current transcatheter valves, is as durable as a surgical valve, and operates more like … well, a healthy human aortic valve. Such a valve would open the door to TAVI’s use in the hundreds of thousands of lower-risk (and generally younger) AS patients whose only current option is a surgically implanted valve, and who would rather not have their chest opened. Now, a man who has dedicated his professional career to studying the aortic valve has invented a new artificial valve design that he says will revolutionize TAVI. And if everything goes according to plan, his TAV will reach European patients in 2015 and U.S. patients soon after. How did he and his startup company design such technology? By reverse engineering the aortic valve. Mano Thubrikar, quite literally wrote the book on heart valves and heart disease — two of them, in fact. His The Aortic Valve (1989) and Vascular Mechanics and Pathology (2007) are leading textbooks in cardiovascular studies, and the former is widely used as a guide in the design of bioprosthetic heart valves. After earning an undergraduate degree in metallurgy, a master’s in materials science, and a Ph.D. in biomedical engineering, Dr. Thubrikar spent the first 30 years of his career exclusively in academic research. He studied the aortic valve and bioprostheses from almost every conceivable angle while working at the University of Virginia (UVA) and at the Carolinas Medical Center and the University of North Carolina (UNC) at Charlotte. But in 2003, Dr. Thubrikar received a phone call that would change the trajectory of his career and set him on the path to develop a novel TAV technology. A woman contacted him to discuss her son, a 35-year-old athlete with a calcified aortic valve. The condition was the result of a bicuspid valve, a congenital condition where the aortic valve has two cusps, rather than the customary three. The man needed a valve replacement, and his only choice was to have a mechanical heart valve surgically implanted. However, the surgical valve meant he would have to stay on anticoagulants for the rest of his life, effectively ending his athletic pursuits. Dr. Thubrikar informed the mother that there just weren’t any treatments available that would allow her son to continue his active lifestyle. 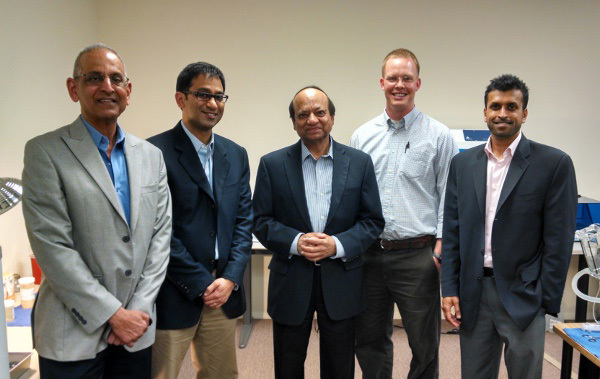 Soon after, Dr. Thubrikar left Carolinas Medical Center to embark on his new mission. He joined artificial heart valve pioneer Edwards Lifesciences as a Distinguished Scientist, but left after it became clear that the company's plans for him didn’t align with his own. So in 2007 — coincidentally, the same year Edwards launched the first commercially available TAV device — Dr. Thubrikar returned to academia, joining the staff at the South Dakota School of Mines & Technology. There he spent the next three years working on a new artificial valve design — one based on decades of research on the physics behind the human aortic valve. 1. A specific coaptation height — When the valve’s three leaflets come together to close the valve, there is some surface-to-surface contact between the leaflets, rather than an edge-to-edge seal. This safety margin helps prevent against blood leakage back into the left ventricle. 2. No folds in the leaflets — Natural aortic valve cusps flex without folding. Folds would crease the tissue and cause unwanted stress on the leaflets, negatively impacting durability. 3. Minimum overall height — Extra height would produce dead space, which can lead to a variety of issues. 4. Minimum leaflet flexion — The human aortic valve manages to open completely with the leaflets moving only 70 degrees, not the 90 degrees you might expect. Again, this improves the valve’s longevity. Suture holes in the leaflet body — While all TAVs (including Optimum TAV) are constructed by sewing animal tissue to a metal frame, piercing the flexion zone of the leaflets leads to potential wear. Optimum TAV does not have a single suture hole in the working portion of the leaflet body. Clipped calcified leaflets — Some current TAVs are anchored to the patient’s original valve using a paper-clip like mechanism. In this design, there is the potential that the TAVs leaflets will come into contact with the old, calcified leaflets during the operation, causing wear. Optimum TAV’s design eliminates the possibility of contact between the leaflets and native valve. Paravalvular leakage — In some cases, a space forms between the outside of a TAV and the surrounding heart tissue, and blood can leak through. Optimum TAV has a high skirt to prevent this type of gap from developing. In addition, Optimum TAV’s novel frame architecture allows it to conform to and seal off either a round or elliptical annulus (the ring-shaped base of the original valve). This is particularly helpful in minimizing or eliminating leakage in bicuspid patients, who often have an irregularly shaped annulus. Balloon expansion — TAV frames made of stainless steel must be forced open by a balloon. The TAV’s tissue can get caught between the balloon and the frame and potentially tear. Optimum TAV’s frame is made of nitinol, which automatically expands once deployed from the catheter. During the two and a half years following the establishment of Thubrikar Aortic Valve, Optimum TAV seemed to be moving steadily toward market. The company raised enough funding to get started, primarily from friends, family, physicians, entrepreneurs, and technology industry executives. Patent applications were filed, suppliers were selected, valves were painstakingly produced (by hand, over one-and-a-half to two days each), and preclinical testing began. But the fledgling company was dealt a major setback in April 2013, when a fire destroyed the Horsham, Pa. office building to which the Thubrikar Aortic Valve laboratory had recently relocated (from South Dakota). All of its equipment was destroyed and needed to be replaced. The company had to relocate to nearby Norristown, Pa. Not an ideal scenario for a startup trying to make the most of extremely limited resources. The company was undeterred by the fire, and the last year has been a successful one for Thubrikar. The company completed most of its preclinical testing (including implants in 12 animals and two diseased human cadaver hearts), reached design freeze on Optimum TAV, filed a provisional patent application for its proprietary delivery catheter, and achieved almost $2 million in total funding. Perhaps the biggest milestone came in August 2013, when Optimum TAV met the International Organization for Standardization’s (ISO’s) durability requirements by surpassing 200 million cycles in a third-party ISO certified laboratory. The durability testing has continued, and Optimum TAV continues to function beyond 390 million cycles, which approximates 11 years in vivo. Surgical valves typically last anywhere from 12 to 18 years, and Thubrikar expects his valve to last at least that long. “I would not be surprised if it surpasses the longevity of even the surgical valve,” he said. The company also received its first institutional investment, from Delaware Crossing Investor Group (DCIG), in 2014. The primary DCIG investor, Marv Woodall, led the commercialization of the world’s first stents as president of Johnson & Johnson Interventional Systems (now Cordis) and was on the board of director of the first TAV company, Percutaneous Valve Technologies (PVT, now part of Edwards Lifesciences). Thubrikar has recruited him as its business advisor. The company is now working to raise an additional $2 million to $10 million, and expects the granting of its patent for Optimum TAV in 2014. The finances will enable Thubrikar to not only conduct a first-in-human (FIH) feasibility study in up to 15 patients this year, but also to expand to a full European clinical trial of about 65 additional patients in 2015. If all goes well, a 2015 CE Mark for Optimum TAV isn’t out of the question. Yet Dr. Thubrikar thinks its only a matter of time until his life’s work finally arrives in the hands of interventional cardiologists, who he said have been “knocking at his door” since he first presented a paper on the technology in 2012. Since then, he has spoken at several of the largest interventional cardiology conferences, and word continues to spread about Optimum TAV. Like many other researchers-turned-entreprenuers, he steadfastly believes that his invention will eventually reach the market, where it can begin helping patients — like the one whose mother contacted him a decade ago. For more information on Thubrikar Aortic Valve and Optimum TAV, visit http://tavi.us/.